Abstract. We currently have little understanding of how birds know what nest to build and what little we do know has been gained largely from investigations of the completed structures (morphology of finished nests) or of material selection. Here we looked at the behaviours performed by male Southern Masked weaverbirds when building their nests. During the two earliest phases of construction individual males varied in the direction in which they carried and inserted grass into their developing nest, the speed at which they completed phases of nest construction and in the frequency with which they dropped grass during weaving. Behaviours performed during the initial attachment phase, when grass is being secured to a bare branch, were not repeatable within males, whereas during the subsequent â€œringâ€� phase behaviours tended to be repeatable. Some males were biased as to which side of the nest they inserted grass blades and strongly lateralized individuals completed phases of nest-building more quickly. 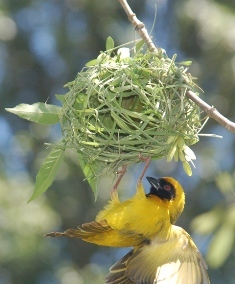 The lack of repeatability of most nest-building behaviours and the changes in those behaviours as males build more nests seems most readily explained by increasing dexterity. Further work is required to confirm any role for cognition in these experience-dependent changes. In this study 7 colour-ringed males were video-taped at Athol Holm Farm, Gaborone. Experienced males dropped grass less often while building nests. A previous study was conducted by these authors at the same locality: Nest morphology in African weaver birds.